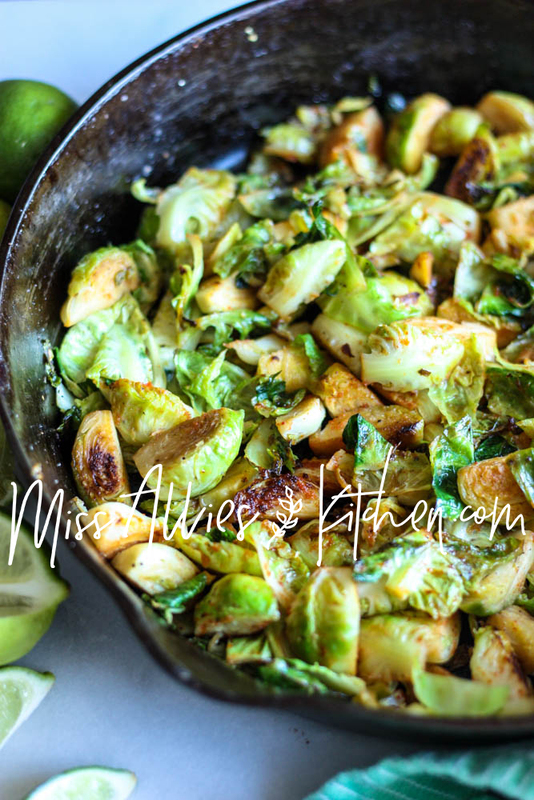 THE Paleo Brussels Sprouts guaranteed to turn any sprout hater into a sprout lover! Hi there! Allie here, with Miss Allie’s Kitchen. Good to see you, good to see you! If this is your first time “meeting” me I’m a healthy food blogger who is privileged enough to connect with you all on The Melrose Family! Today I want to talk about (duhhhn, duhhnnn, duhhhn) brussels sprouts. They’re one of those foods that you either love, or love to hate. I think people have a hard time, well, because they have a tendency to get stinky & bitter when cooked certain ways. Veggies can be a hard sell sometimes, too. If you have some veggie haters in your life, give these Sneaky Sweet Potato Oat Cups a try! I’m all about making “healthy” foods taste great, and sometimes mindful cooking techniques and awesome seasoning is just what you need to take them to the next level. 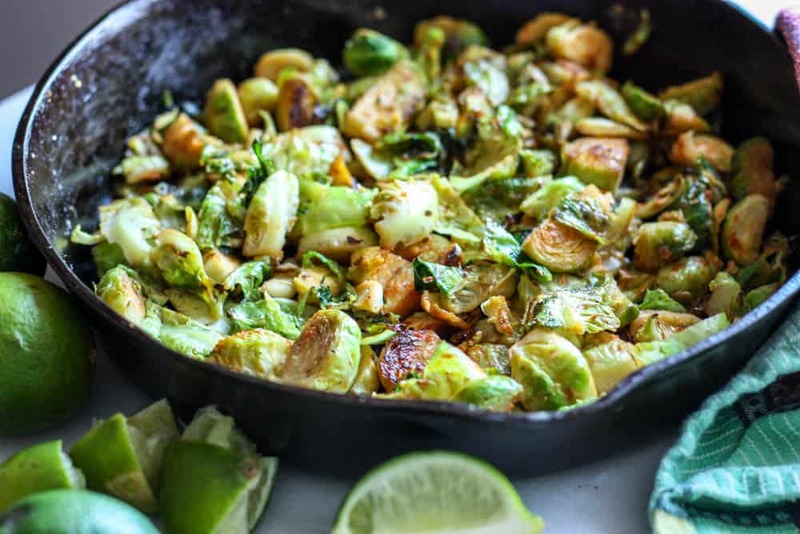 We’ll be cooking these Brussels on the stovetop in a cast iron skillet. I have so much love for my cast iron pans. If you love yours, check out this Apple Spice Skillet Cake and my Veggie & Sausage Skillet Quiche! 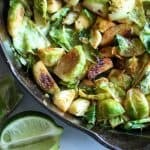 Anyway, if you pan roast the Brussels on medium high heat to ensure that they have a nice crisp on the exterior, and then hit them with a flavorful sweet and spicy glaze, you’re right on the money, honey! Wash and dry your Brussels. I like to cut my Brussels sprouts into quarters if they’re large, so cut the end off of each sprout and cut into four pieces. When they are cut, heat a skillet over medium-high heat. When the pan is hot, add the oil and dump in the veggies, salt, and pepper. Cook, stirring and moving them occasionally for 8 minutes or so, or until the edges start to brown. While they cook mix together lime juice, red curry paste, and maple syrup in a small bowl or ramekin. 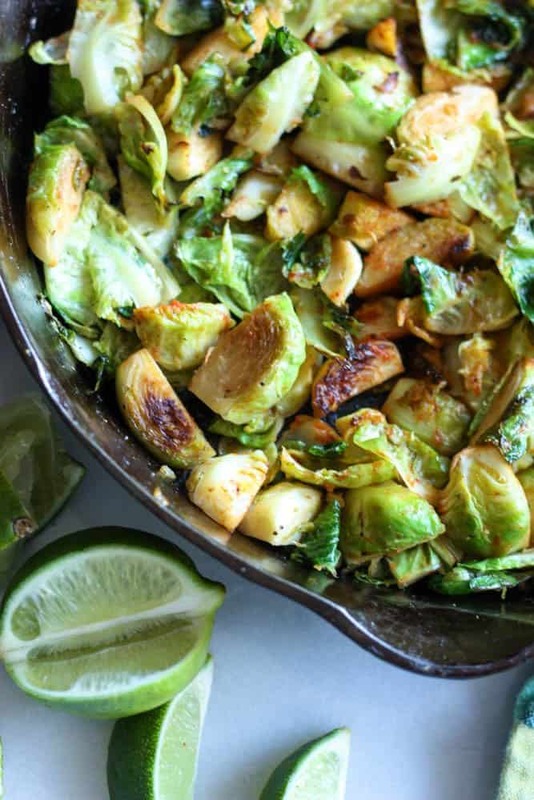 When the Brussels have finished cooking, hit them with the sweet and spicy glaze and toss. They’re ready to serve! 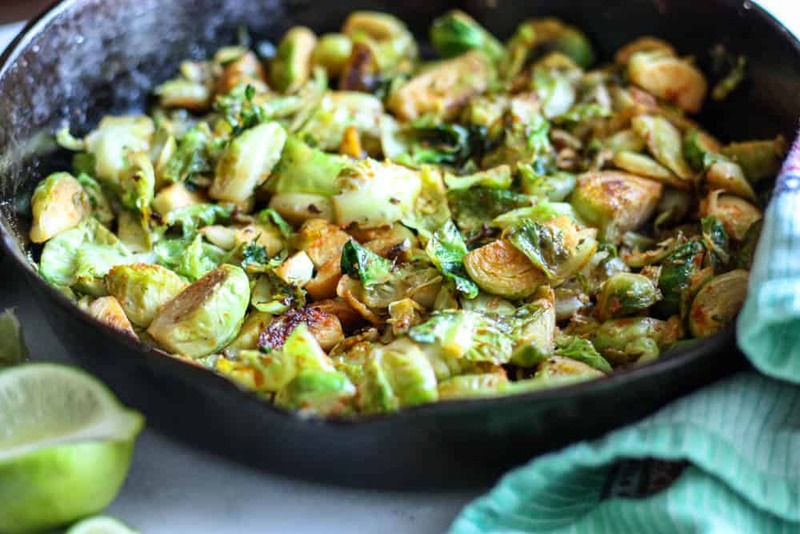 The paleo brussels sprouts guaranteed to turn any sprout hater into a sprout lover. Trust me when I say this is one recipe you have got to try! Wash and dry your Brussels. I like to cut my Brussels sprouts into quarters if they're large, so cut the end off of each sprout and cut into four pieces. When they are cut, heat a skillet over medium-high heat. When the pan is hot, add the oil and dump in the veggies, salt, and pepper. Cook, stirring and moving them occasionally for 8 minutes or so, or until the edges start to brown. While they cook mix together lime juice, red curry paste, and maple syrup in a small bowl or ramekin. When the Brussels have finished cooking, hit them with the sweet and spicy glaze and toss. They're ready to serve!